Nexium 24HR is a proton pump inhibitor (PPI). Proton pumps are your body’s acid pumps, which are located on the cells that line your stomach. Nexium 24HR works by blocking acid at the pump, giving you 24 hours of protection from frequent heartburn when used as directed. In fact, PPIs like Nexium 24HR are the only FDA-approved medication for over-the-counter treatment of frequent heartburn. 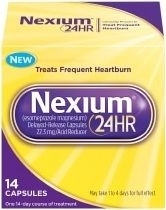 People 18 years and older with frequent heartburn (occurring two or more days a week) can take Nexium 24HR. •Frequent chest pains. These may be signs of a serious condition. See your doctor. •Heartburn over 3 months. This may be a sign of a more serious condition. If pregnant or breast-feeding,ask a health professional before use. Keep out of reach of children. In case of overdose, get medical help or contact a Poison Control Center right away. Adults 18 years of age and older this product is to be used once a day (every 24 hours), every day for 14 days; it may take 1 to 4 days for full effect. Repeated 14-Day Courses (if needed); you may repeat a 14-day course every 4 months; do not take for more than 14 days or more often than every 4 months unless directed by a doctor; children under 18 years of age: ask a doctor before use. Hearburn in children may sometimes be caused by a serious condition. * Based on IMS Health data: total NEXIUM® prescriptions 2006-2013.